PARIS: A man wielding a knife and an iron bar injured seven people, including three tourists, in Paris, in an attack that bystanders tried to stop by throwing petanque balls at the assailant. Four of the victims were in a critical condition, police said, after the man, believed to be an Afghan national, went on the rampage next to a canal in the northeast of the capital on Sunday evening. Two British tourists, an Egyptian tourist and a local man were among the injured, police added. The suspect, believed to be in his thirties, had been overpowered by bystanders and was unconscious when officers arrived on the scene and took him to hospital, police said. A source close to the inquiry added that though he had targeted foreigners, “nothing at this stage suggests a terrorist attack”. Chaos erupted on the banks of the Bassin de la Villette, an area popular with locals and visitors who frequent the cafes, cinemas and other cultural venues along its banks, just after 11pm. Eyewitness Youssef Najah, 28, said he was walking beside the canal when he saw a man running and holding a knife about 25-30 cm long. “There were around 20 people chasing him. They started throwing petanque balls at him,” Najah said, referring to the sport popular in France also known as boules. “Around four or five balls hit him in the head, but they weren’t able to stop him,” he added. According to the same witness, the attacker then dived into an alleyway, where the man “tried to hide behind two British tourists. We said to them: ‘Watch out, he has a knife”. But they didn’t react”. The pair, said by police to be in their fifties, were then attacked, he said. A security guard at one of two cinemas on either side of the water said he had seen the attacker running away from two men who were trying to stop him. “He had an iron bar in his hand which he threw at the men chasing him, then he took out a knife,” he told AFP. 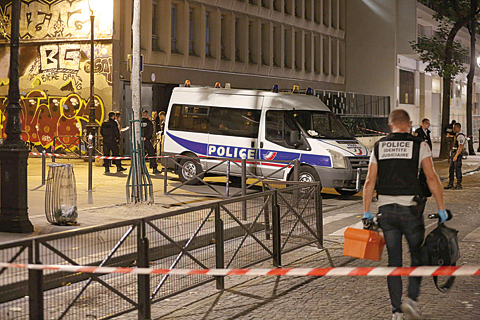 An Algerian man identified as Smain told Le Parisien newspaper he was part of a group that apprehended the attacker. “I managed to jump on him and throw him to the ground and get his weapon off him,” he said, adding that the attacker sustained “several blows from petanque balls, iron bars and sticks” and “looked drugged”. The UK foreign office said it was aware of reports of the attack and was “urgently investigating this incident” in cooperation with French authorities, British media reported. Interior Minister Gerard Collomb in a statement praised those who intervened to stop the attack for their “responsiveness and courage”. A police investigation has been launched for attempted murder, according to a judicial source. It is the latest of several knife attacks France has seen in recent weeks. On August 23, a man stabbed his mother and sister to death and seriously injured another person in a town near Paris before being shot dead by police. The motive for the violence remained unclear despite a claim by the Islamic State group that it was an attack by one of its fighters responding to the terror organization’s propaganda. Authorities said the 36-year-old had serious mental health problems and had been on a terror watch list since 2016. That attack came days after an Afghan asylum-seeker was arrested in the southwestern town of Perigueux for a drunken rampage with a knife in which four people were wounded, one seriously. Police said investigators had “very quickly” dismissed a terrorist motive after the August 13 incident. And on June 17, two people were hurt in another southern town when a woman shouting “Allahu akbar” (God is greatest) attacked them in a supermarket with a boxcutter knife. France has been on high alert following a string of jihadist attacks in recent years, often by people who have become radicalized or claim to have acted in the name of the IS group. More than 240 people have been killed by Islamist extremists since a massacre at the Charlie Hebdo satirical magazine in Paris in January 2015. French police arrested a man yesterday following a high-speed chase on the runway at Lyon airport after the driver rammed his car into the terminal and drove through the building. Police said they began pursuing the white Mercedes when it was spotted speeding the wrong way down a nearby highway. The driver first smashed through a security barrier at the Lyon-Bron business airport before changing direction and heading to Lyon’s main Saint-Exupery airport about 20 kilometers away. There he rammed into automatic glass doors near the main entrance to Terminal 1 and drove through the building, smashing through another set of doors before emerging onto the runway, chased by about a dozen police vehicles as well as a helicopter. A video posted online showed the car smashing into the building with a bang and showed the view afterwards of the smashed doors on either side. The dramatic chase, witnessed by an AFP journalist waiting on a plane at the airport, was captured in an amateur video posted on social media.